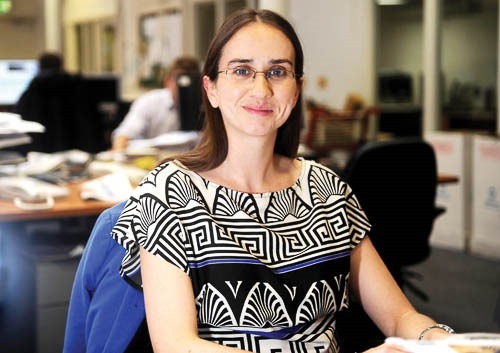 Irish News journalist Maeve Connolly discusses the highlights and challenges in her career to date. How did your career in journalism come about? My foray into journalism was a direct consequence of realising that in order to become a vet I’d need to be able to put animals to sleep and study physics to GCSE – two things I couldn’t stomach at age 13. I always loved writing and reading books and by my mid-teens it was journalism or nothing, and I signed up for an undergraduate degree in English and French at Queen’s University in Belfast. I spent the third year of my degree in rural France teaching English to surly teenagers and living in a village so small it only had one street. I still have nightmares about it. At university, I co-presented a hospital radio show and did stints in the Ballymena Times which was where I fell in love with the profession. From there, the next step was a postgraduate diploma in newspaper journalism at the University of Ulster which led to the Irish News and I’ve been there, happily, ever since. Who have been your main mentors? On a personal level, my parents have always been role models. My dad died in January 2013 and I miss his guidance but his loss makes me appreciate my mum all the more. Professionally, I am very lucky to have worked alongside talented journalists throughout my career. At the Ballymena Times, I watched a small team put out a big paper every week and it was there that I realised the term ‘multi-tasking’ had most likely been coined for such people. When I studied newspaper journalism at the University of Ulster, my tutor was the veteran reporter Brendan Anderson and he continued to offer advice and support to students long after graduation. Starting in the Irish News was daunting but an incredible learning experience. The newspaper is known for its high standard of journalism and places a lot of trust in its young recruits. There’s no better way to hone your skills than being thrown in at the deep end. Journalism is a competitive industry but there are reporters who are generous with their time and advice and former Irish News colleague Barry McCaffrey is one of those people. What are the main pros and cons of working in print journalism? Journalism is an exciting job that provides an adrenalin rush and as such is probably a little addictive. Working in print journalism is fantastic because no two days are the same. I love that I am constantly learning new things and meeting people from all walks of life. It’s a challenging but exciting time in the newspaper industry as we navigate our way through stormy waters and embrace new technology. For me, writing is a pleasure and I love being able to have fun with my weekly column, Sleb Safari, which pokes fun at celebrities. The downside of being a reporter is that you are often dealing with people at their most vulnerable, or aggressive. And then there’s the fact that news never stops; it’s not the type of job where you turn off your computer when the hands on the clock reach 5.30pm. Which stories stand out as the most significant to date? I’ve been fortunate enough to have travelled a little for work and on a personal and professional level, two trips I took to Malawi, in south-east Africa, stand out the most. In autumn 2002, the country was in a severe food crisis and I travelled there with the charity Children in Crossfire to report on the situation. Within weeks of the stories appearing in the Irish News, readers had donated £250,000 and in January 2003 I returned to Malawi to find out how the money was being used. Another trip that was challenging but very rewarding was in April 2010 when I covered crisis talks in Rome between senior Vatican figures and Ireland’s bishops who had been summoned for unprecedented talks. I find that any occasion where you get to work on new turf alongside journalists from around the world is exhilarating. My favourite thing is to spend time with my husband who is a gem (but won’t thank me for saying so), my mum and my friends, though not necessarily at the same time. I also volunteer with a performing arts charity called Barefeet which works with children living on the streets in Zambia and has recently started working with youth groups in Ireland, and that takes up a lot of my free time. On top of that, I love running and salsa dancing and I’m a convert to Zumba and yoga and like a game of tennis, so on any given week I do a combination of all of the above. I also love travelling, go to the theatre as often as I can and I’m never without a book. Alternatively, give me a box set of ‘30 Rock’ or ‘Parks and Recreation’ – or anything by Tina Fey and Amy Poehler really – and I’ll happily watch it in one sitting.